Dr. Gangrene's Mad Blog: 3rd Naschycast is up and running! Rod Barnett and Troy Guinn have posted the third Naschycast over at The Bloody Pit of Rod. 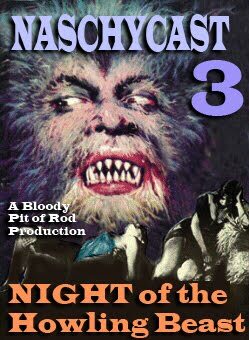 This month's movie is the Paul Naschy werewolf flick, Night of the Howling Beast. Go swing by the website, give it a download and a listen and tell em' Doc Gangrene sent ya!